Leave the fruit and whole spices to marinate in the sugar for a few hours if you can. Sterilise 4 or 5 jars in the dishwasher the day before. On the chosen jam day, put the sugar and fruit mix in a jam pan with the lemon juice and zest. Get it up to a rolling boil then turn the hob down a bit and let it bubble for 8 min. Pour the vinegar in the last few minutes. Check the setting by dropping a tear-drop of jam onto a cold plate. It should look thick and jelly-like. Give a quick rolling boil again then retrieve the vanilla pod and cut the strip in bits. Put one in each jar and pour the boiling jam after it. Screw and turn each jar upside down to sterilise through. This my godson favourite jam and he can clean up a jar in one single seating! But even if you are not into teenage gluttony, this is an unusual and richly fragranced jam to try on toast and muffins. 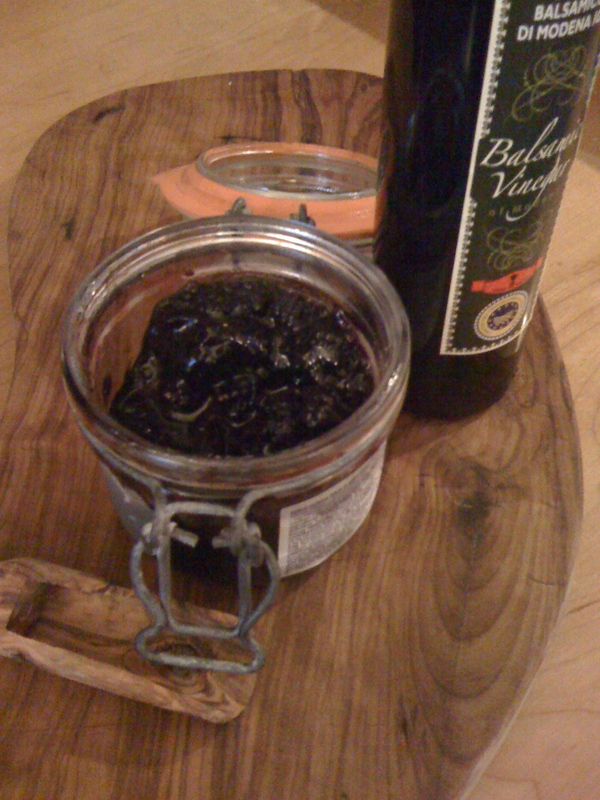 This entry was posted in family favourite, treats and tagged balsamic, blackberries, Jam. Bookmark the permalink.